Designed for comfortable family cruising and twilight club racing, the new Jeanneau Sun Odyssey 35 is one answer to New Zealand's aging fleet of mid-size cruisers. Australian Trade-A-Boat correspondent Vanessa Dudley tested the first boat to arrive downunder. Major French boatbuilder Jeanneau launched two new sailing models in 2003: the Sun Odyssey 54 Deck Saloon and the Sun Odyssey 35. While the larger of the two is big and glamorous enough to steal the limelight, the 35 will undoubtedly be the bigger seller. 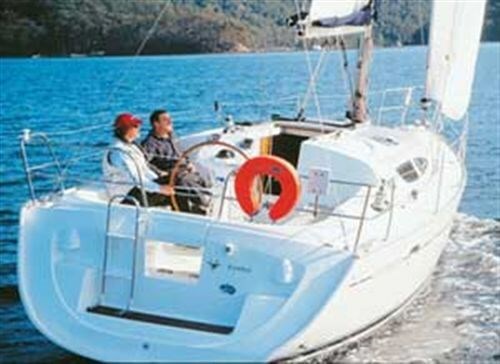 The Jeanneau range of yachts is handled in New Zealand by Darryl Hayter of Taylor Marine Brokers. 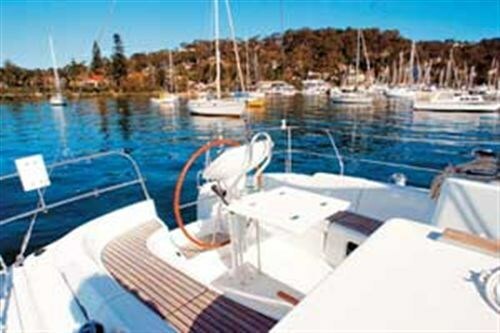 The company has recently landed a Jeanneau Sun Odyessy 32 and Jeanneau Sun Odyssey 35 as demonstrators. Both yachts are available for viewing and test sailing and are based at the company's brokerage offices at Auckland's Half Moon Bay Marina. At 10.42m overall length, the 35 is aimed squarely at the centre of the family cruising and sailboat charter market. It has been designed by Marc Lombard, one of the hot names on the Open 50 and 60 long-haul racing scene, indicating that sailing performance has been taken seriously. At the same time it is undeniably a people carrier, with the large volume interior space allocated effectively to suit private ownership in the two-cabin version tested, or bareboat charter in the optional three-cabin layout. Like the 54 DS, the 35 benefits from some handsome new styling around coachhouse windows and the like, which provides an eyecatching modern look. And there is substance behind the style updates - the 35 offers a combination of practicality and aesthetic flair, which is generally well conceived and presented. The Sun Odyssey 35's Lombard heads a French company known for its Open 60 and Mini Transat racing monohull designs, as well as a variety of production boats including the Privilege catamarans and the latest Beneteau Figaro single-handed one-design. With the 35 he has produced a beamy but well-proportioned hull with modest overhangs. The beam is carried from well forward through to the stern and down to the waterline. Chantiers Jeanneau is a giant concern producing a wide range of sailing and powerboats from its modern facilities near Nantes in France. I was able to visit the factory late last year and see first-hand the sheer scale of the place, and the curious blend of highly labour intensive and highly automated functions that comprise production boatbuilding at today's major yards. All of Jeanneau's yachts are built of hand-laid GRP, with not a chopper gun in sight among the small army of workers wielding fibrelass cloth and resin rollers. In other sheds, the Burmese teak veneer joinery is cut and varnished by giant machines with just one or two human operators at hand. Hull construction of the Sun Odyssey 35 is in hand-laid GRP, incorporating vinylester resins in the outer layers for osmosis protection. Floors, stringers and bulkheads are fully bonded to the hull, and the hull and deck are glued and bolted. As the major production boatbuilders look for ways to improve production methods while also meeting future environmental safeguards, such as styrene gas emission controls, a variety of new injection moulding techniques are being employed across the industry. Jeanneau has introduced the Prisma injection moulding process for the production of the balsa/GRP sandwich deck on the 35. The company provides a five-year transferable warranty on its hulls. The standard fin keel is cast iron with a large bulb at the bottom, while the rudder is a high aspect spade. An optional lifting keel version is available, incorporating a twin rudder system with connecting rods. The standard steering system (by Goiot) is chain and quadrant, with Jeanneau's self-aligning bearing system. The standard rig is masthead with two sets of swept-back spreaders, a split fixed backstay and a babystay to support the centre of the mast against pumping in a rough seaway. The standard sails are an overlapping roller-furling genoa and a semi-battened mainsail with boom "lazy" bag. On the test boat, the first one imported into Australia, the sails were upgraded but the boom bag and lazy jacks are standard issue. A number of other upgrades have been included on this boat as part of what's called the Comfort Pack (free) and as optional extras. 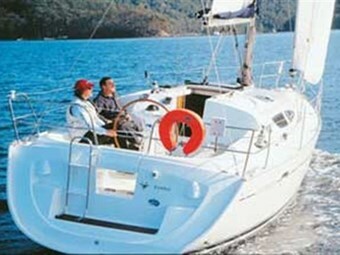 For example, there's a folding fibreglass cockpit table attached to the front end of the substantial steering pedestal, a hot/cold cockpit shower, a tender outboard engine bracket, and an electric anchor winch. An electronics pack including the Raymarine ST60 Tridata, ST60 Wind and Interphase GPS chartplotter is included in the Comfort Pack and the Plastimo Horizon 135 compass on the steering binnacle is standard issue, as is the teak trim in the cockpit. There's nothing particularly new about the deck hardware or its layout, with the mainsheet traveller placed forward on the coachhouse to provide an open and uncomplicated cockpit. It's possible to run the mainsheet back aft if you want to put a fixed point into the cockpit floor; the Sun Fast version will have a traveller in the cockpit. There is only one coachhouse-mounted winch to handle halyards and sail controls, and two primary winches on the cockpit coamings to deal with the headsail sheeting. On the two-cabin version there is excellent storage in a very large cockpit locker to port, plus in the shallower starboard seat locker. There is room in the transom for one large or two small gas bottles, and a bellows-style manual bilge pump. The central section of the transom seat can be dropped down easily to provide through access to the boarding/swim platform.The engine throttle is on the steering pedestal and there is an engine control panel which is a little hard to reach from the helm, at least on first acquaintance. The two-cabin layout provides a moderate-sized double cabin forward; a comfortable saloon with U-shaped dinette to starboard and settee with nav station to port; a relatively large bathroom with separate shower recess immediately aft, opposite an L-shaped galley to starboard; and a very large double master cabin aft on the starboard side, providing fore-and-aft or transverse sleeping arrangements depending on personal preferences. The optional three-cabin version substitutes two smaller double cabins aft, and a smaller bathroom that does not have the luxury of a dedicated shower stall. With private sleeping arrangements for three couples, at an extra cost of around $A6000, this is likely to be the version favoured by charter companies. 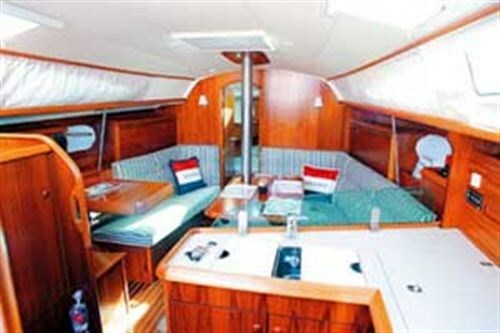 The saloon has a bright and warm ambience, with the numerous windows, hatches and lighting offsetting the teak veneers. There is comfortable seating around the central table, which has an extension leaf that can be added in the middle, or stored under the forward cabin's mattress when not required. The table can be raised up the mast compression post, upon which it is mounted, in a novel approach to providing access to storage spaces and cleaning. Or it can be reset low for use with the U-shaped settee as a double berth with optional upholstery. Another thoughtful approach to space utilisation is evident at the aft end of the settee to port, where Jeanneau has provided a chart table on slides and a small bench seat at the aft end, allowing the navigator to decide if he or she wants to work facing forward or aft. This arrangement also allows the settee to be used as a single berth if required. It's not the most comprehensive deal for navigators, but it's probably based on a fair assessment of how much time most 35-footers' nav stations are actually used for that purpose. The bathroom is just big enough to house the shower stall with moulded GRP bench seat over the manual loo (a 45-litre holding tank is included as standard) and there is access to the large storage area in the port quarter. A door divides this area from the vanity unit with sink and storage cupboards forward. The galley has twin sinks with pressurised hot/cold water supply, two-burner stove/oven and a large (140-litre) top-opening refrigeration unit. A perspex splashback shields the foward end of the bench space. There is decent cupboard space for provisions, cookware and crockery (supplied in the Comfort pack) and storage space throughout the boat is generally good. The standard engine is a 29hp Volvo Penta marine diesel in the usual position under the companionway. Access and soundproofing both seem satisfactory. Other Comfort pack extras on the test boat include a 220V power supply with five sockets, battery charger, third (extra) battery and CD radio with two speakers in the saloon. We were in the fortunate position of being able to sail the Sun Odyssey 35 twice, both times on flat water - firstly in a blustery southerly wind on Sydney Harbour ranging from 5-20 knots, and then in a light breeze on Pittwater ranging from 0-8 knots. The boat provided more performance than I was expecting. That sounds patronising, but I was pleasantly surprised by the boat's liveliness and its accomplished handling of sudden strong gusts. I was also impressed by the positive helm, the responsiveness and general manageability of the boat under both sail and power. The mainsail has a one-line reefing system and the roller-furling genoa, obviously, can be part furled to deal with the fresher stuff. But the boat's relatively deep keel (1.85m), in combination with the hull's form stability, provided an antidote against involuntary round-ups. The rudder showed no tendency to "let go" early when the gusts came through, avoiding that horrid feeling of uselessness that overcomes steerers when there's nothing there in the helm to prevent the boat from skewing up to windward. This is a boat that likes to sail - but buyers really looking to harness that performance will probably want to consider the Sun Fast version, because the Sun Odyssey version maximises cockpit space and simplicity at the expense of maximum trimming capabilities. As it is, the boat will happily fit the bill as a local and coastal cruiser that won't disgrace itself in twilight club races and other social occasions - and it offers an impressive amount of interior space and comfort for its size range.